DEC has apparently answered my latest FOIL (but didn't inform my by email). I requested all documents related to the SEQR review of the original Pilot program which began in 2011. Right now there is no index to these documents. I am working on this now, and will make an update later tonight. Could really use some help, more eyes on this. Just take a few docs, look them over, and give me a few sentences describing what they are. First thing to note is that the analysis was done in buckets, using a scientific model, not using the actual EIT (now I3) facility. 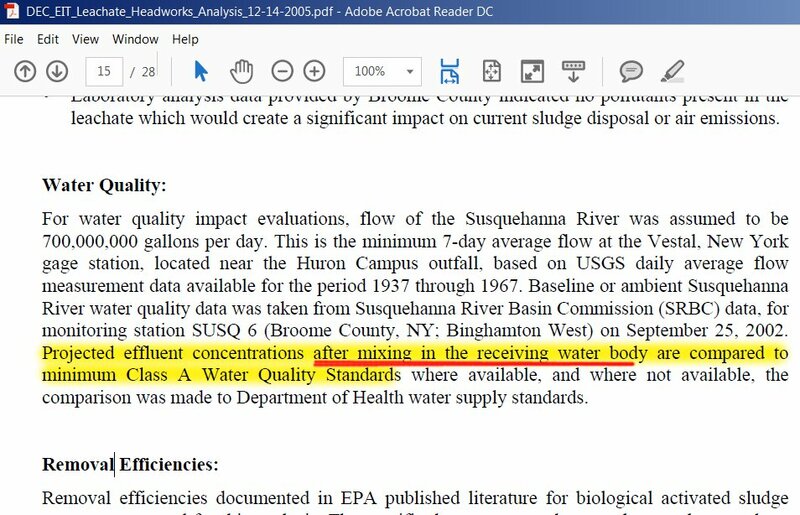 Next thing to note is that the sample was Broome County Landfill leachate, and not "Reverse Osmosis Concentrate" from Seneca Meadows, which is chemically very different, and more concentrated. "For water quality impact evaluations, flow of the Susquehanna River was assumed to be 700,000,000 gallons per day. This is the minimum 7-day average flow at the Vestal, New York gage station, located near the Huron Campus outfall, based on USGS daily average flow measurement data available for the period 1937 through 1967. 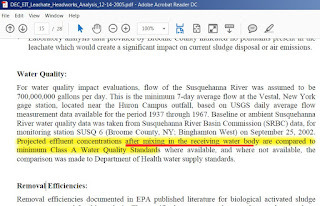 Baseline or ambient Susquehanna River water quality data was taken from Susquehanna River Basin Commission (SRBC) data, for monitoring station SUSQ 6 (Broome County, NY; Binghamton West) on September 25, 2002. Projected effluent concentrations after mixing in the receiving water body are compared to minimum Class A Water Quality Standards where available, and where not available, the comparison was made to Department of Health water supply standards." We were told by the Village Mayor John Bertoni that the effluent discharged met "EPA drinking water standards". We can now see this is not exactly truth. It's STILL toxic, poison. But it becomes safe after it mixes with 700M gallons of river water. But what happens when the river water flow is extremely low? Like now? Do they stop dumping? No. Mark Bacon tells me he has not seen any slowdown of the trucks, even in these last few weeks of extremely low river flow. The Village of Endicott is still under a conserve water emergency.